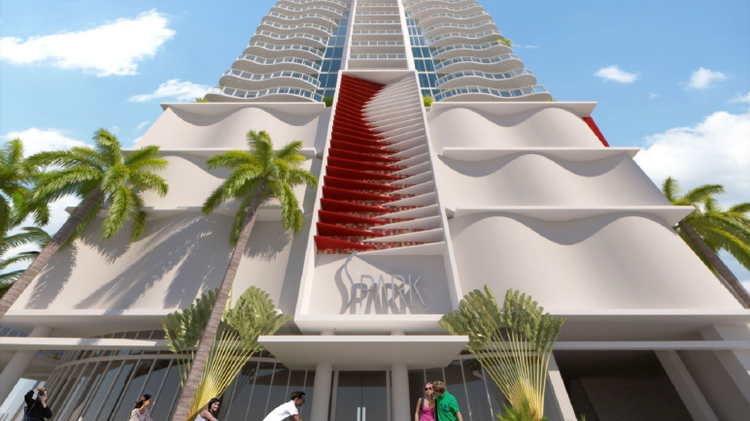 Spark would have 56 condos in 28 stories. Miami’s new high-rise haven in Edgewater has a 28-story condo tower on the drawing board. The strip along Biscayne Bay north of downtown Miami has attracted many condo and apartments developers, including Melo Group and the Related Group. Now Union Excalibur LLC, led by Alejandro Eskenazi and Andres Goldenberg of Miami-based Spider Investments, has proposed Edgewater Tower, which is being marketed as Spark. The project at 522 to 526 N.E. 34th Street would have 56 multi-family units, plus 3,000 square feet of commercial space and 300 square feet of office space. The floors would have two or three condos each. There would be 99 parking spaces. Units would range from 955 to 3,925 square feet. Amenities would include a pool, media room, music room, game room and fitness studio. The developer’s representative Robert Behar of Behar Font & Partners couldn’t be reached for comment. The developer purchased the 16,500-square-foot site for $3.55 million in February. It currently has one home. It’s located just outside the parking lot of Bay Park Towers. The Spark lot is about a block west of the water and units there would probably have limited water views – as long as another developer doesn’t build a high rise on the homes and vacant land immediately to the east of the proposed project.